Spirulina is the biomass of cyanobacteria (blue-green algae) that is consumed by humans and other animals. SIM Organics Super Foods Spirulina Powder contains contains 5% water, 24% carbohydrates, 8% fat, and about 60% (51–71%) protein. Spirulina is called a complete source of protein because it contains all the essential amino acids that a human body would need. Spirulina does magic to your body. It has numerous of health benefits because of powerful antioxidants and anti-inflammatory properties present in it. A single tablespoon (7 grams) of dried spirulina powder contains 4 grams protein, Vitamin B1, Vitamin B2, Vitamin B3, copper, Iron, magnesium, potassium and manganese and small amounts of almost every other nutrients that we need. Thus, it may be the single most nutrient dense food in this world. Phocyanin is the main active compound in spirulina powder . It has powerful antioxidant and anti-inflammatory properties. It helps to fight against free radicals. Studies show that spirulina powder can lower trigylcerides and LDL cholesterol which is good for heart health. Also sometimes it may raise HDL cholesterol. 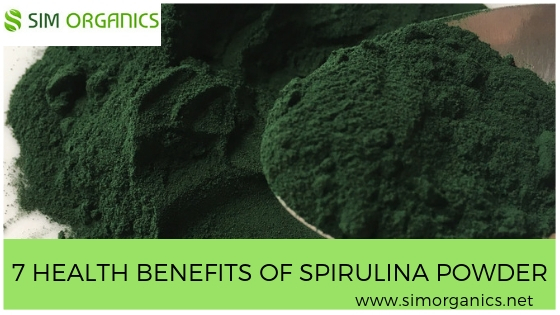 Spirulina helps to increase production of nitric oxide, a signalling molecule that helps the blood vessels to relax and contract. Higher dose of spirulina powder results in lowering blood pressure levels. Spirulina comes packed with beneficial protein, fats and carbohydrates, which your body breaks downs during digestion process to promote good digestive health. Also it’s good in chlorophyll that’s great for reatining & restoring good digestion. Spirulina contains Vitamin E, selenium and tyrosine which are all known for their powerful anti-aging effects. Also it can help you fight off free radicals & eliminate toxins which can lead to the formation of acne. Spirulina helps to speed up hair growth, reduces hair loss and help facilitate hair renewal, also reduces dandruff & makes hair glossy and stronger. Older Why Is Mushroom Powder Beneficial For Health?